For the third season running, SpinVFX has had a leading part in creating the compelling universe of The Expanse. Thanks to the ambitious vision of its creators, SpinVFX was able to bring one of the most visually mesmerizing shows to life. From Bobbie Draper’s dramatic spaceship climb in the premiere episode, to the fan-favourite Ringstation interior in episode 310. Over the past 8 months, SpinVFX’s award-winning team created nearly 100 assets, and delivered 327 complex shots for the 12-episode season. 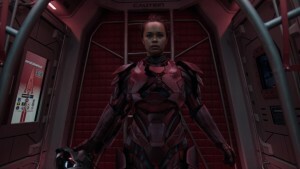 The visual effects team was led by VFX Supervisor Kyle Menzies (Star Trek Discovery, Marco Polo, The Leftovers), who oversaw every detail, including the creation of the Guanshyin Ship, Bobbie’s iconic body armour, and the growth of the protomolecule infection in Katoa Merton to name a few. 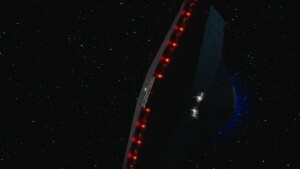 “This season continued the evolution of the Protomolecule towards the final reveal of its mysterious purpose. Portraying this, as well as the wide variety of new locations and effects, provided our team with a different set of unique challenges” says Menzies. Katoa is the third protomolecule-infected character that SpinVFX has developed. The character was born in the SpinVFX Creature Department, under the leadership of Creature/Concept Supervisor Cesar Dacol Jr. (Disney’s Descendents 2, Pompeii, 300). He explains that “in this case we have two seasons of history to build on, so it was important to understand the biological changes that were occurring in Katoa, and break them into elements that we could control.” The creative opportunity was only enhanced this season by the fact that his son, Jordan Dacol, appeared in episode 305 as the infected proto-hybrid that later transforms fully in to the monster. The unparalleled devotion of the fans has been pivotal as they waged a campaign that captured the attention of Amazon, which has picked up the fourth season of the show. Their overwhelming support of The Expanse, and SpinVFX’s work on it, has renewed the future of the show. As fans of the The Expanse, SpinVFX is proud to be a part of its enduring legacy.